Join Eyes4Everest Founder Shaun Chang on an eye clinic building trip! We will be setting the foundation for Khumjung and Pangboche en-route to Everest Base Camp and the infamous Island Peak (6189m). Welcome to Nepal! We will meet you at our allocated hotel in Kathmandu. Today is about meeting and getting to know everyone, checking your gear and preparing you for the journey ahead. We will explore Thamel and gather any last minute items such as Nepalese currency, SIM cards, gear, snacks and toilet paper. The streets are packed with souvenirs to your heart's content. We have dinner at our favourite restaurant and have an early night sleep. We travel to the domestic airport in the early hours of the morning to avoid any flight delays. A packed breakfast will be provided so you don't get too hungry. When we arrive in Lukla, our guide will take us to a nearby teahouse where we will meet all porters and guides then the trek begins! The first leg is a relatively easy trek along the Dudh Kosi River that flows from Mt Everest. We venture to Phakding for lunch then Monjo and spend the rest of day relaxing. We begin the slow and challenging trek towards Namche Bazarr. The journey takes you through towering suspension bridges and pine forests. If the weather is good, you will get your first glimpse of Mt Everest! We will check into our tea lodges and take it easy for the rest of the afternoon to acclimatise. Your guide may take you to the National Park Visitor Centre or the Sherpa Museum or Sonam Photography to buy and post some beautiful postcards to family and friends. It is a short steep walk to main Sherpa settlement of Khumjung. 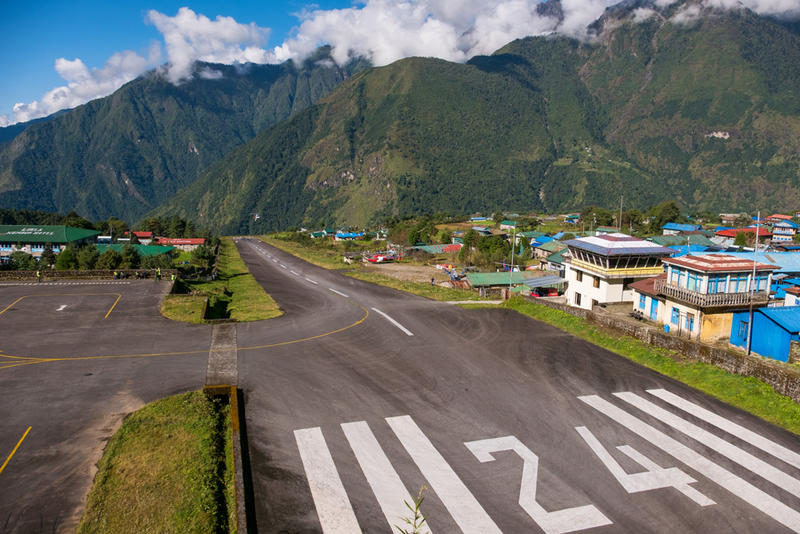 We will pass an old airfield, admire the Mountain Alps in the open and visit the Everest View Hotel. A hearty lunch awaits us at our accommodation in Khumjung. Afterwards we will visit the Khunde Hillary Hospital where we will set up our eye clinic and take it easy for the rest of the day. The Khunde Hillary Hospital was Sir Edmund Hillary's earliest project in the Everest National Park. There we will perform eye testing for the local people like the many volunteer Kiwi doctors before us. Sherpa doctors and nurses will assist us on the day. We make our way downhill to Phortse Thanga, a nice change from the continuous climbing. After crossing the Dudh Kosi River we begin the slow ascent towards the village of Phortse. Most of the Sherpa here work as climbing guides for big expeditions. The village is seldom visited by trekkers so the Sherpa culture is well preserved. We set up our eye clinic at the Phortse primary school and examine the villagers with the help of the teachers. The walk from Phortse and Pangboche is challenging with ups and downs. We will have a chance to visit the Pangboche Monastery - the oldest in this region and set up our clinic in the community hall. At 4400m, Dingboche is where most trekkers start to experience altitude sickness so it is very important we spend a day to rest here. We have the option of walking towards the village of Chukhung where most climbers prepare to summit Island Peak. We are fulfilling our promise to test eyes here given reports 20 villagers could not make the journey to Dingboche for their eyes to be examined in 2016. If we finish early, we will pack our bag and head to Dingboche to rest. We start early in the morning and move at a slow and steady pace. The slopes are barren and the wind is strong and cold. After a quick rest at Thukla, we trek up the Dhugla Ridge and onto the moraine towards the Khumbu Glacier where we visit a sacred memorial dedicated to lives of fallen climbers on Mt Everest. It is a sad and beautiful place. We spend the night in Labuche. Today we wriggle out of bed at 4am for a summit attempt of Kala Pattar, a small mountain with fantastic panoramic view of Mt Everest, Pumori and its nearby peaks. It’s a painful process but the view and the sunrise makes it all worth it. From the top you can look down onto Everest and Pumori Base Camp. We then head back to our lodge in Gorak Shep for breakfast before we start our quick descent back to Dingboche. This morning we have a relatively short trek alongside the Khumbu Glacier to Gorak Shep followed by an early lunch. After lunch we commence our trek to Everest Base Camp which is approximately 3 hours return. Congratulations you made it! However we must spend a cold night at Gorakshep to attempt to summit Kala Pattar – the best place to view Mt Everest up close. We spend the night in Gorak Shep. Today is our final day in the mountains. Wave goodbye to Everest and continue down the valley. After the river bank, we walk across ‘Nepalese flats’ until we reach the village of Monjo. Take some time to relax in the village. We wake up at 5am and assemble all our packed bags at the lobby then wait in the dining room with coffee or tea and toast for our flight. It is a quick dash to the airport when our Sherpa guides give us the all clear – it is chaotic inside the airport but our Sherpas make it easy. After touching down in Kathmandu, we return to our hotel hoping to catch breakfast. We spend the day resting and exploring Kathmandu. A Cultural Dinner Program (beverages are not included) await us in the evening. This is normally a buffer day in case we get delayed by bad weather. After breakfast, we visit a local family run restaurant and learn to make either 'Dhal Bhat' or Momo. This is followed by lunch and a guided tour of the Boudhanath Stupa where we will meet a singing bowl master for some relaxing sound therapy. We have our last dinner together. We pack our bags and get ready to go home or on to our next big adventure. There maybe time to visit the Dubar Square or the Garden of Dreams. We hope to see you again and thank you for being a part of Eyes4Everest!